Attack of the killer Monarch’s – eeekkkk! OK, so they don’t really attack, they don’t bite or tear your flesh off (maybe a zombie butterfly would? Hmm??). They don’t really hurt anything in their butterfly form. But looking at our blue mist bush in the corner of the yard gave us a moment to pause and ponder…where did they all come from? The bush was invaded by butterflies! 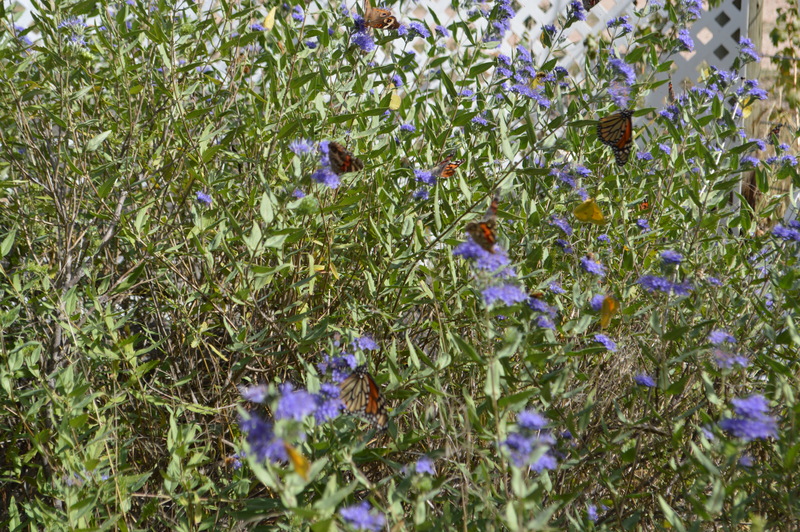 Monarchs first caught my eye, then when I followed them, I found the bush covered in butterflies. 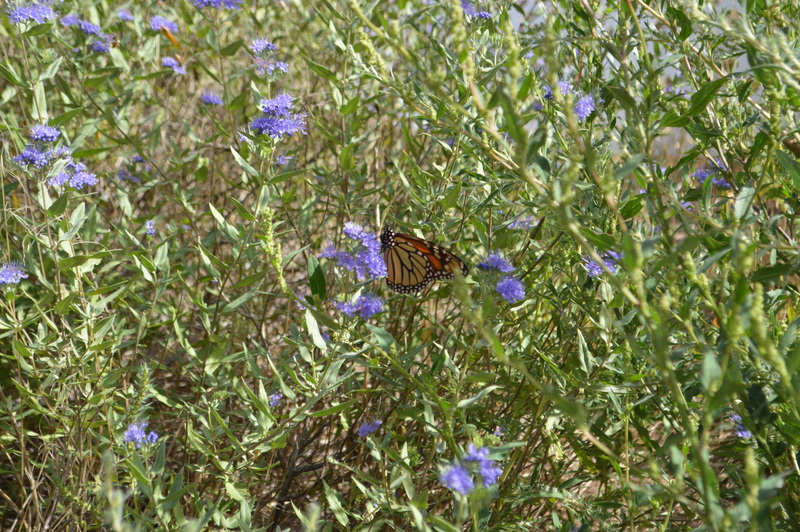 I don’t know what all the names are, there is a smaller version of the monarch (in color) but with grey fringed edges. A smaller yellow with bits of green, and I also recognized the cabbage moth (often mistook as a butterfly) floating around the bush. The honey bees were also going crazy sucking the nectar off the flowers. My belief is that this must be the best time of year for the blue mist to give off sweetness. That would explain the insect coverage. We have seen farmers spending decades on getting rid of weeds in their fields. Unfortunately a lot of those “weed” are food sources or habitats for a number of other creatures. The milkweed pod plant is a favorite of the Monarch but, until this year, we didn’t have many around. Now we have bunches! Even our county road crew was nice enough to leave them alone in our ditches. There are a number of things that love the milkweed pod plant. It also has the added benefit of creating a great dried little cup type form that works great on a number of crafting projects (makes great Spock-type ears for our pumpkins – hee hee). This year (if I can collect enough) I want to try a wreath out of them. I don’t know where they all came from this year. I don’t know where they are going to (Mexico I think? ), but I am very thrilled that they used us as a pit-stop for several days. I hope that we gave them enough rest and food for energy to get them through the balance of their journey. Can’t wait to see what surprise we get next year! Monster Monarchs Munch Mexico?? Enjoy! ← DOES ANY OF THIS MAKE YOU SMILE UNCONTROLABLY? Thanx! It’s just our front yard – the bush is what made them so happy! Thanx Lizzie! Like your blog also! You take great pics! Thanx for sharing them too!! Thank you, I just became a more involved photographer this year. REALLY?? That surprises me! I always pictured (moms side is Irish and I would like to visit some day) it so green and lush that I just assumed you would have most of the things we had in Wisconsin. It is also green and lush – here in Colorado it is mainly dry. We get rain (had lots this year – more than normal) and snow, just not a “lush” area. Great sandy-loam soil for growing in though!! I would love to hear more about your area! And definitely pics!! It is lovely and green and lush. 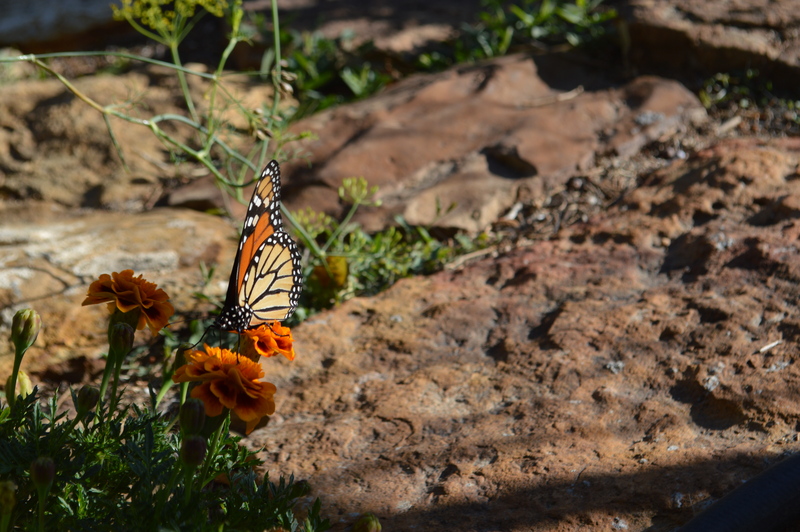 And monarchs are occasionally visitors to the southwest for a month or two but that’s about it. Never seen one here. I’m going to try and put more pics up in Instagram more regularly. Still feeling my way around. Have a widget on my blog that shows my Instagram posts. Going to start the 100 Happy Days challenge. Will wegoid for the head especially coming into winter. I am new to Instagram – still trying to get a handle on it also. Cant wait to see your pics! Thanx for sharing! !